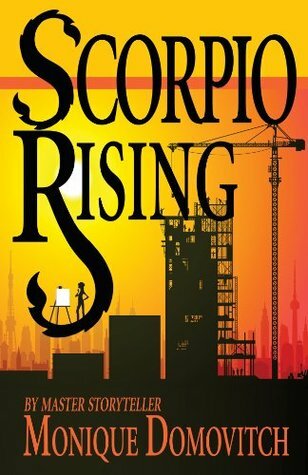 Scorpio Rising (The Scorpio Series #1) by Monique Domovitch. Publication : September 15th 2011 by Lansen Publishing. I'm happy to feature Scorpio Rising (The Scorpio Series, #1) by Monique Domovitch today. The author's insanely generous and is willing to giveaway two copies! One's for someone from US/Canada and one's International. Cool huh? Well, check out the excerpt and if this seems like a book you'd enjoy, enter the giveaway :) Happy Reading! There will be two winners, one picked from within the US/Canada and one International. Winners have 36 hours to respond or a new one will be picked. Monique Domovitch was born the first in a family of ten children in a small town in Northern Ontario, and maintains to this day that she was not harmed by the experience. She attended The Sacred Heart Convent, a boarding school where she learned to keep her hands folded neatly in her lap and to smile vaguely when people use profane language around her. Her first job was as a fashion model, and she is credited with the invention of the famous pouty pose that is now used by top models everywhere. She has turned thirty nine again this year and pledges to do it again next year. Just like everybody else in the world, she is working on a new novel, this one, her fourth. I like reading historical fiction but I wouldn't call me a fan. Until now I read a lot of Victorian and Tudor times related books but I also like reading about the 20s. What I don't like are the books dealing with the World Wars. Don't really know why. I love historical fiction. I like books dealing with issues pertaining to Nazi war etc. I love historical fiction! My favorites are English history and Egyptian history. I love historical fiction. My favorite time period is turn of the century urban America, but I like reading about all time periods. Thank you for the international giveaway! I love historical fiction, especially Victorian and Regency era. I like historical fiction and usually war-time settings appeal to me. I like historical fiction. I've been fascinated with Egyptian culture since I was a kid. I love historical fiction.. I just read The Forgiven Duke by Jamie Carie and it's awesome..